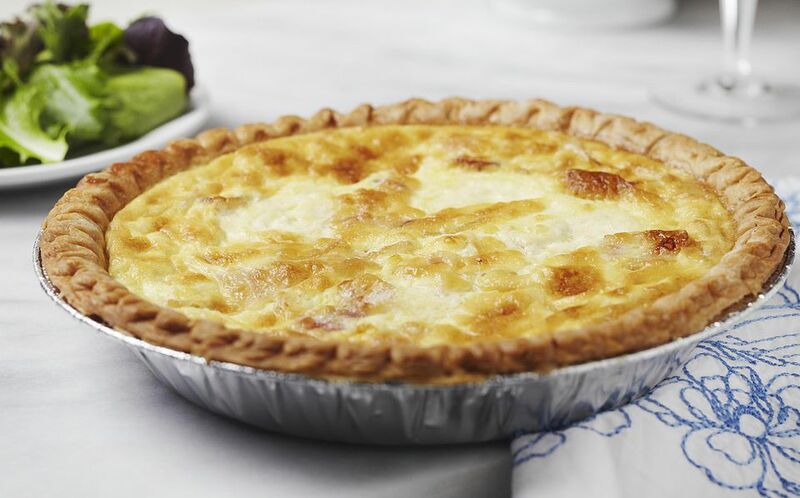 This recipe for a classic Quiche Lorraine is so adaptable! You can change the type of cheese you use, according to what you have on hand. Leave out the bacon, or use ham or canadian bacon. You can use a combination of cream and ordinary milk for the half and half. Add sauteed vegetables. Use shrimp, or chicken, or cooked sausage. I know two little girls (well, they aren't little anymore) whose favorite quiche flavor is spinach! Once you master a quiche recipe, you will never have to go to a drive-through again for dinner. Keep some pie pastry, either homemade or purchased from the store, frozen in the freezer. Let the pastry thaw on the counter while you get the filling ingredients prepped. Then roll out the crust, fit it into the pan, add the filling, and bake. Voila! Dinner will be on the table in about an hour. Quiches are a great way to use up leftovers. Leftover cooked veggies, chicken, shrimp, steak, salmon, or tuna are all delicious when transformed into a cheesy quiche. This thrifty French recipe should be one of the mainstays of your repertoire. All you need to serve with this quiche is a nice crisp green salad and a glass of white wine. For dessert, offer some brownies or perhaps an ice cream pie. This recipe makes a wonderful lunch or dinner anytime, and it's special enough for company. In fact, think about making two or three quiches when you have people over for dinner! Make each quiche a little bit different and let your guests choose the ones they want to eat. Combine the half and half, eggs, salt, pepper, and thyme in a large bowl and beat well with a wire whisk or egg beater. In a medium bowl, toss the cheese with the flour and sprinkle into the unbaked pastry shell. Top with the bacon or other meats or vegetables that you want to use in the recipe, then carefully pour the egg mixture into the pie shell. Bake the quiche at 350°F for 40-50 minutes, until egg mixture is set, the filling has puffed slightly, and the top is golden brown. Let cool for 10 minutes, then slice into wedges to serve.